For the past several days, the United Methodist Church has been meeting in Tampa, Florida for its General Convention that is held every four years. At this convention, the delegates approved a resolution calling for a boycott of Israeli products made in the West Bank. The assembly also rejected a resolution that would require the denomination’s Board of Pensions and Health Benefits to sell its stock in three companies that do business with Israel — Caterpillar, Hewlett Packard and Motorola. The defeat of the divestment proposal was a bitter pill to swallow for many of the activists that descended on the UMC’s General Convention. Jewish Voice for Peace was out in force at the assembly, as were a number of anti-Israel activists from inside the denomination. As is to be expected at the national assembly of any mainline church in the United States, the proceedings bespoke of a monomaniacal obsession on the alleged sins of the Jewish state and absolute silence about the misdeeds of other countries in the region. Search the legislation before the assembly for resolutions regarding Coptic Christians in Egypt or Assyrians in Iraq and you will find nothing. I would just ask us all to imagine we were United Methodists in the 1930s and 40s [and] that our Board of Pensions held stock in the very successful manufacturing firms in Germany that bid and received the bids to manufacture the ovens for the concentration camps. At what point would we decide it was time to divest? How much evidence would we ask for before it was time to stop the wholesale destruction of people? Margaret Novak compared Israeli policies in the West Bank to the destruction of Jews in Europe. She made this statement in front of several hundred people and the moderator of the assembly let her statement pass unchallenged. Novak’s suggestion that the Israelis are perpetrating a genocide (“wholesale destruction of people”) is defamatory. The population of the Palestinians has grown fourfold in the decades since the 1948 War. Will someone from the UMC’s leadership condemn Novak’s remarks before the General Convention comes to an end on Friday May 4, 2012 or will they pass unnoticed? This is a reasonable question to ask. The UMC has been the source of some ugly rhetoric in the past. For more information about this problem go here and here. James E. Winkler, General Secretary of the United Methodist General Board of Church and Society (GBCS), can make it right. He can issue an unequivocal apology for the ugly anti-Semitism that was allowed to pass unchallenged at the UMC’s General Assembly on May 2, 2012. It is also reasonable to ask if Jewish Voice for Peace [no relation to the Philadelphia Jewish Voice!] is going to condemn Novak’s rant. As stated above, JVP was out in force at the assembly. And will the Methodist activists, operating under the banner of UM Kairos Response condemn Novak’s statement? 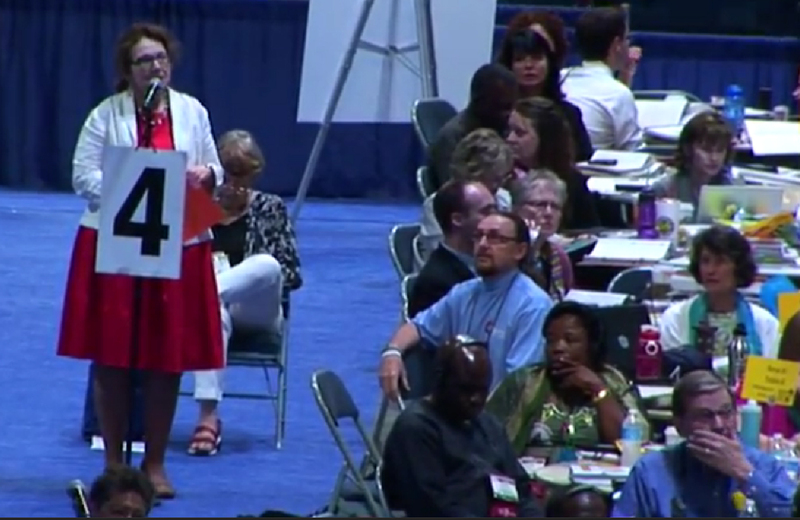 Such rhetoric simply cannot pass unnoticed at the UMC General Convention. Will Winkler act? Will Jewish Voice for Peace respond? Will UM Kairos Response?